introductory chapter of this book demonstrates the application of form criticism to the text. Chapter two then presents a form-critical study of the prayer genre. It identifies three productive formulae and addresses distinct social settings and forms associated with them. The third chapter begins by defining the liturgy genre vis-à-vis prayer in the Qurʾān. Drawing a line between the hymn and litany forms, this chapter treats each in turn. Chapter four considers the genre classified as wisdom literature. It identifies sapiential formulae and sheds light on wisdom contexts. The fifth chapter examines the narrative genre writ large. It also surveys narrative blocks of the long saga. The subsequent chapter on the proclamation genre inspects a set of vocative formulae, which occurs in the messenger situation. The concluding chapter looks at the corpus through synchronic and diachronic lenses. 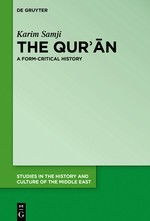 - In the end, Qurʾānic genres encapsulate the form-critical elements of formulae, forms, and settings, as well as an historical dimension.